I hope everyone is enjoying a wonderful Christmas with their family and friends. Since you are probably stuck in your house with some less desirable in-laws or extended family, here are some body weight workout ideas that you can knock out. If you are as fortunate as I am to have a 60 lb weighted vest willing to jump on you at any time, I suggest using it. Here is Charles’ contribution to the post. He also recommends a few games of basketball on a hang-on-the-back-of-a-door goal for good cardio. Merry Christmas from the Stovers! Over the weekend, Rick Majerus, college basketball coach, passed away. 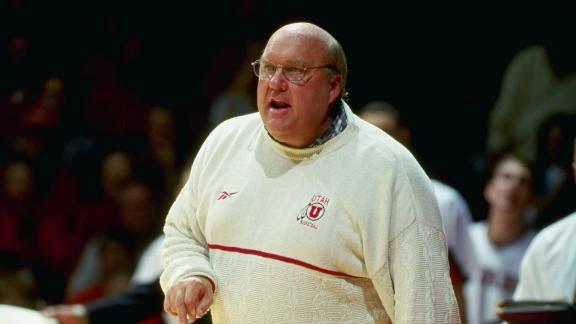 Coach Majerus had ongoing heart problems and died of heart failure at the age of 64. He had been overweight for many years, and unfortunately it finally caught up to him. This served as a reminder to me what terrible shape our nation is in as a whole. For some reason we are worried about a lot less important things than our health. Since the hot topic seems to be the economic state of our nation, let’s look at our health from a purely financial point of view. USA Today found that obesity costs an extra $4,879 for women and $2,646 for men. When you factor in earlier loss of life, it goes up to $8,365 for women and $6,518 for men. I actually think this is low because it did not mention anything about increased health insurance, which factors in BMI*, and extra medical bills that could possibly occur from general decreased health due to the extra weight. An article by CNN in 2010 stated that a research study “found that indirect and direct costs of obesity is as high as $147 billion annually” based on 2006. I guaranSHEED that number has increased considerably. Now imagine investing more in your health now to prevent future expenses that would occur with weight related problems. It doesn’t take a rocket scientist to figure out investing $1000 a year now to prevent $2000-4000 in expenses later is a smart thing to do. You also can’t put a price tag on the increased quality of life and added years to spend with your family. I know what you are thinking, you are suggesting people to spend more on exercising because that results in people like me having more work. While this is true, it is hardly my motive. I find it sad to see the direction our country is going. I think it is terrible that 33% of children are overweight or obese and are set up for a life battling a weight problem because of the lifestyle that has become the norm in America. If you don’t know the steps to take or just need accountability, spend the money to get the proper guidance. It will be the smartest investment you have ever made. *BMI stands for Body Mass Index. It is used to classify a person based on their height and weight. Average is defined as 18.5-24.9. Overweight is 25-29.9. Obese is 30 and above. It does not take into account muscle mass so it can be misleading. One of the questions I get a lot from athletes of all levels (usually males) is what do I need to do to gain weight? The solution I have found is groundbreaking. It’s quite simple: you gain weight by consuming more calories than you burn. That is why our nation is overweight. No exercise + terrible eating habits = fat gain. I gained 3 lbs on Thanksgiving because I literally sat around and ate all day until I was uncomfortable. If you are an athlete and have trouble gaining weight or keeping weight on, you are more than likely consuming less calories than you burn every day. For me personally, I need around 3200-3500 calories on my lifting days. Michael Phelps was said to eat 10,000 calories a day while he trained. This is slightly higher than the recommended 2000 calories for the general public. It is important to follow the guidelines I laid out for you in the Nutrition section, along with eating foods with high nutritional value as opposed to just piling on the fast food. Not all calories are created equal, and the calories from healthier foods will provide more nutrients to your body than something like Romen Noodle. Nate Green did an insane 34 day weight manipulation on himself. While I would never recommend an athlete, or anyone else, doing this to themselves, take a look at his diet over the first 28 days he was trying to gain weight. That is a TON of food. I’m not suggesting you follow this exact diet or any others, I just think it is helpful to see what I mean when I say eat more. This is definitely more. If you want to look like our friend at the top, eat like him. If you want to put on some weight, get out your stretchy pants and go to work.